When it comes to remodeling and decorating your home, it's always helpful to see what's popular and trending. If you haven't updated your home for a while, you're in for a treat. Technologies have improved so that there are more durable and great looking options for more affordable prices, and many innovations have allowed more smart technology breakthroughs with more convenience. This trend report is based on what I see in the majority of higher end and luxury homes, as well as what's trending on Pinterest and Houzz. Some of these trends aren't new...they have been growing in popularity for the last 5 to 10 years, and others are on the brink of rapid adaption. You will also see that many of the trends are synergistic with each other. I've outlined 15 key design trends and decided to dig deep on the heart of the home...the kitchen. This trend has been emerging for years now, and I'm constantly seeing home buyers look for open concept floor plans during the home buying process...or else they are checking to see which walls are load bearing and what they can knock down the week after they close on a home. Open concept floor plans have so many advantages. Not only do they make your space look larger, but they also make the cooking, dining, and gathering spots more informal, flexible and cozy. Most often, the kitchen space is opened up into a family room space (even if that means eliminating the dining room). This way, mom can keep an eye on the kids without hovering over them. Friends and guests have an easy way to gather for coffee and chat. In addition, open floor plans allow more light into the home, so it brightens the area up and makes it look more cheery. And, it gives you more flexibility in your space for furniture, addition of an island and multiple seating areas. During the day, everyone loves to have natural light. We are seeing larger (as well as more) windows that allow natural light in as well as leverage the view of the outdoor landscape. You will be amazed at what a difference replacing and enhancing your windows can make. Many older windows have developed a haze on the glass (sometimes because the double pane has been broken) and the frames often have many layers of gunky paint. In addition, most newer windows are more energy efficient, so they will make the indoor temperature more comfortable while helping save money on your energy bills. With larger windows, more light poring in and updated white framing, it will give your room a whole new look. On the lighting front (for the evening), we have seen a revolution in lighting. Not only do we see lighting in more areas (e.g. under cabinet lighting, over island lighting, kick plate lighting), but we are seeing many pendant lights that add style and personality to a room, especially in kitchens, entry areas, family rooms, dining rooms and living rooms. These can range from rustic/farmhouse style lights to super modern and contemporary lighting options. The possibilities are endless. As a nice little side benefit, you'll be happy to know that the new age lights are more efficient and longer lasting than the halogen or fluorescent bulbs. The master bedroom suite has really become a true sanctuary, especially among luxury home buyers. The suite includes a larger and luxurious bathroom (often spa-like), his and her large customized closets/changing areas, a larger main room, and often an extra room which is sometimes used as an office or exercise room, or temporary nursery area. Bathrooms tend to have all of the bells and whistles with an upgraded shower (i.e. larger and multiple shower heads, seating areas, glass enclosures. The vanities tend to include double bowls (undermount) and we are even starting to see smart and heated toilets, and of course radiant heat floors. Some are even opting for wireless music systems and warming drawers. Sharon Paxson with Newport Beach real estate has some tips for turning your bathroom into a spa. The appliances and homes are just getting smarter and smarter. We are starting to see refrigerators that will alert you when grocery items are running low (and soon, they'll make it easy to reorder them, too). Coffee makers can be programmed to have your coffee brewed and ready for when you wake up. Lighting and heating systems can be programmed with to adjust based on time of day and they can be adjusted from smart phones and tablets. And, of course more and more people are using Alexa for more tasks. Kitchens are getting larger, and they are the centerpiece for the home. It’s the key gathering spot for the family and guests, so homeowners are making this area as welcoming and versatile as possible. Most prefer open floor plans for extra space and this has enabled more and larger islands. Kitchens, of course, are also the first spot that home buyers look for, and they can make or break a home sale. Since kitchens are so central to the home buying experience, I wanted to dedicate a whole section to what’s in style for kitchen and highlight some of the latest trends. Homeowners are gravitating towards commercial grade and larger appliances, especially for stoves and refrigerators. Most integrate smart technology and extra safety features. When there is space, most are opting for larger sizes. For ovens, we are seeing more convection and steam ovens which cook faster and more evenly. The appliances have also become quieter and more energy efficient. Over the last few years, farmhouse sinks have been rapidly growing in popularity. Some people choose farmhouse sinks (often called apron sinks) solely for style purposes. Others love them because of their ergonomic benefits (they are easier on your back) and they are easier to wash and soak large pots and pans. Because they are so popular, you can now find farmhouse style sinks in virtually any material – fireclay, porcelain, stainless steel, copper, soap stone and even granites/natural stones so that they will match your counter tops. As kitchen islands have become more common and larger, they are also becoming more convenient with sinks as well as outlets and charger areas. But, my favorite added convenience is the pot filler, so you can add the water directly into your pot on the stove (without the need to carry the pot across the room). And, we are seeing more interesting faucets and levers…as well a touchless faucets that work with motion sensors. Linear patterns and movement have become super stylish and you will see them in many areas of the kitchen. Most notably, I’ve been seeing linear patterns in backsplashes (the trend is towards thinner, longer and random patterns), linear movement in counter tops, wood look tiles and now even in cabinet design. You'll also notice more linear pull handles for the cabinets. Of course if all elements a linear, it becomes too busy, but introducing this pattern in one or two select places gives your kitchen some active movement and visual intrigue for a more interesting and contemporary look. Over the last several years, in higher end and luxury homes, the strong preference for counter tops has been towards marble! Yes, marble…as impractical as it may sound (marble is porous and requires a lot of maintenance). Specifically, the marble of choice has been Calacatta, which is precious and rare marble from Italy. When compared to Carrara marble, Calacatta more white than gray with dramatic veining that results in thicker and more intriguing patterns. Each slab is unique. And, the whiter the slab, the more expensive it is. It’s significantly more expensive than most marbles and granites and it’s generally fabricated in thicker sizes…so it’s out of range for many budgets. Now, due to innovations and technology improvements, you can find very impressive quartz counter tops that have a very similar look to the brilliant Calacatta marble, as well as several other variations that are white and light in appearance. Many homeowners prefer this lighter and less granular than granite. Not only are quartz counter tops more affordable, but they are much easier to clean and maintain. If you are having thoughts of selling, Petra Norris of Lakeland Real Estate Group, Inc has an incredible resource on bathroom remodeling trends that sell , Anita Clark with Coldwell Banker in Warner Robins Georgia has key bathroom updates to sell your home faster, and Kevin Vitali with Exit Realty in Essex and Northern Middlesex has information on staging your kitchen so it sells - hot insider tips. White cabinets continue to be most popular and are still growing. Gray cabinets are 2nd most popular and rapidly growing, especially as islands are growing in size and many are opting for a different color for the island. This is followed up closely with navy and black cabinets, especially for the featured centerpiece. These elements are timeless and neutral, and they tend to go with almost all schemes. While brass and gold are starting to make a comeback, I don’t expect them to gain much traction as there is such a preference towards cool color trends throughout the home, and the cool silver colors go better with these tones. Golds and brasses just pigeon hole you and only go with a few colors. Also, most appliances, as well as sinks are stainless steel, so sticking with the silver tones creates a more unified look in the kitchen. This year, they’ve been introducing all sorts of colorful appliances (e.g. bright blues, reds and other retro colors). These tend to be much more polarizing and I’m sure will not stand the test of time. And, given that most people buy refrigerators, stoves, dishwashers and microwaves as a set, this just isn’t very practical (unless you have the budget to switch them out every 3 to 4 years). If you're interested in learning more about current kitchen trends, Karen Holt Highland with EXP Realty in Frederick Maryland has written a great resource Kitchen Remodeling and Decorating Trends for Homeowners and Bill Gassett with Remax in the Metrowest Massachusetts area has kitchen home improvements to boost your home's value. There’s a growing preference towards both multi-generational living (as the grandparents may move in to help raise the grandkids, or as there is sometimes a need to take care of an aging parent) as well as universal design, as more and more are buying “forever” homes and hope to age in place. Universal design means widening hallways and doorways (so they are wheel chair/walker accessible), making it easier to enter and exit bathrooms and shower areas (i.e. reducing the height of thresholds and tripping hazards), seating areas within showers, consistent flooring levels across surfaces and rooms, and when possible building a Master bedroom on the main floor. Sometimes, in larger homes with multi-generations, you will also see 2 sections of the home, each equipped with its own kitchen. This is a really fun trend and in some cases, it’s an easy way to add some flair to a home without a major remodeling project. In rooms that have higher ceilings (or large double floor entryways), we are seeing more and more interesting and varied ceiling treatments. Sometimes this is as simple as adding exposed beams and woodwork. Sometimes, builders are adding in coffered, vaulted or tray ceilings. Sometimes, it’s even as simple as adding some elegant crown molding. It is amazing what can be achieved with these sorts of projects and how this often overlooked area can make a room look extra special. What’s old is new again, and nowadays, rustic and farmhouse style décor has been reinvented to the max. This style isn’t for everyone, but for those that love it, it’s more than just a décor style…it can become a way of life. 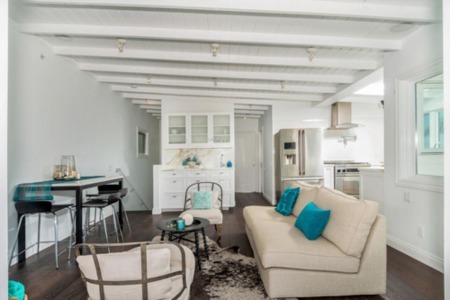 Modern farmhouse style incorporates light, neutral and soothing colors from whites, grays, light blues and greiges, as well as shiplap walls (thanks in part to Joanna and Chip Gaines and their hot TV show, Fixer Upper). We have been seeing a resurgence in sliding barn doors, farmhouse sinks, windmills and everywhere you look on Pinterest, you’ll find farmhouse signs and the farmhouse script. You will see items that are “upcycled and repurposed” for unusual décor combinations…in lights, wall décor, coffee tables and accessories. It’s an informal and welcoming décor that is meant to make your guests feel at ease and create closer family connections. Multi-generational living & universal design. Yes, gray still remains the most popular wall color, by far. 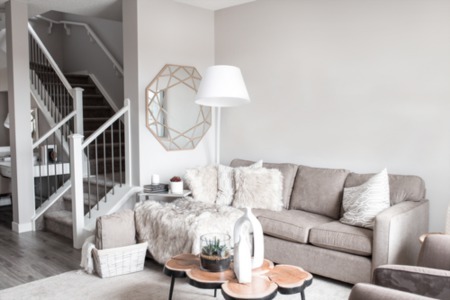 Gray (and greige…which is a combo of gray and beige) dominate the wall pallets as they are so neutral making it easy to decorate with and allowing for accent colors galore. The gray tends to pair well with dark hardwood floors (which is the most popular), as well as white washed and even mid brown and light floors. The new and rising star color is navy. Navy is also a cool color and coordinates so well with gray. Navy has become the 2nd most popular color.in area rugs and it is such a great accent color, so it's perfect for pillows, accent chairs and accent walls. When used as an accent color, it's a great way to add some color depth without making a room look too small or dark. Painting is one of the easiest renovations to do, and it can have a huge on the look and feel of your home. As homeowners are painting more, they are also getting more daring with accent walls. Accent walls are a great way to add depth and dimension to a room, as well as color. For accent walls, we've been seeing more dramatic and deeper colors including dark grays, navy and even black. But, it can be any color that you love. When you choose a darker accent wall (especially if it's in the same color family as the rest of the wall), it,creates depth illusion so it appears to push the wall back and make the space look a bit larger (if it's just done in 1 area). 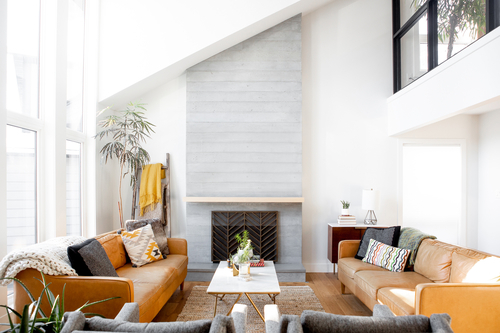 Accent walls can be fun, and it can be a way to renovate a room every few years by just changing the color of one wall, along with switching out an area rug and pillows. We are also seeing more and more mosaic patterns in small defined spaces such as kitchen backsplashes or powder rooms. And, occasionally, we are seeing shapes and textures on an accent wall. The most popular shapes are hexagons, chevrons, harlequin diamonds, and moroccan tile shapes. We are seeing these in tiles (floors and walls), removable neutral wallpaper (in small areas such as an accent wall), area rugs, pillows and window treatments. We are also seeing a surge in stenciling, so that these patterns can be painted onto walls. For the floors, we are also seeing a resurgence in vintage black and white patterned tiles. Most busy households with kids are renovating the main entrance area for the kids into mudrooms with stylish tiles and comfortable sitting areas so that the kids can take off their dirty shoes (and boots) before entering the main area of the home. This makes cleaning and organizing much easier. Many are turning this area into a command center where each kid has their own cubby space and items for the next day can be stored in this area. And, for some, it also becomes an extra storage area for bikes and other outdoor equipment. 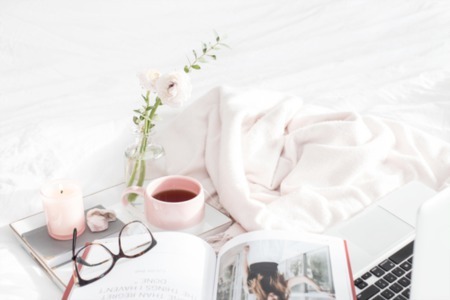 More and more people are choosing to work at home, or to work at home part time (or a day a week), so they are converting spaces into a comfortable working environment. Often, this involves converting an extra bedroom, den or even a dining room into an office. Some are even using a section of the kitchen for this, especially if they have a larger kitchen and are remodeling. Hardwood flooring is the preferred flooring surface, and it continues to grow. And, interestingly enough, the 2nd most popular choice is to get floors that look like hardwood. The two most popular choices for this are 1) wood looking tiles and 2) engineered vinyl plank flooring. The latter has been an innovative product called Coretec Plus made by US Floors. This new product looks like wood, but it's waterproof, and it has a cork underlayment, so it's softer on your feet and provides a bit of insulation. In terms of colors, dark flooring is by far the most popular (think ebony, espresso, dark walnut and blends of these colors). The tones are darker and browner and there a strong move away from reds and red undertones. This is followed by very light hardwood floors, especially paler and lighter tones that drown out the yellow. Natural is the by far the most popular when it comes to light, and many are gravitating towards high end water borne polyurethanes as they look more natural and do not show the yellow that you would see with an oil based poly. Grays and whitewashes are the next most popular shades. It's certainly more challenging (and expensive) to get these tones with hardwoods, and they tend to work best on white oak and maple, rather than red oak. Satin and matte finishes are the most popular. They are also the most practical as they show dents, scratches and dirt less. Shiny and semi-gloss finishes are dated and show the imperfections more. Check out this article on 2019 Hardwood Flooring Trends to keep up on the latest flooring styles. Yes, "less is more" and it certainly holds true in design. We've been noticing that there is a trend towards simplicity and streamlined designs throughout the house. In the kitchen, this sometimes translates to removal of upper cabinets in some areas...to allow more space, light and breathing room. In paint colors and flooring, it translates to more consistency of flooring surface and paint colors throughout the home, especially on the main level of the home. We are also seeing a preference towards less intricate molding. Most home owners love nice base molding and crown molding, but the preference is for cleaner lines and fewer ridges and grooves. Many are learning that decluttering relieves stress as well as make the area look larger, so we are just seeing more space, and often less furniture...and less "stuff" on that furniture. Many are removing built-ins, and bookcases, as these tend to take up space and add more visual distraction from the items place in or on them. Some people take this to an extreme via minimalism. But, for the majority, it's just a paring down and simplification.